One of this blog's first guests was the speculative author Rhys Hughes. I thought I'd rerun his wonderful essay on magical realism. Enjoy! The term 'Magic Realism' is a mysterious one and I am frequently asked to explain what it means. The truth is that it's a vague term and has many precise definitions, which perhaps is the same as saying it has no precise definition at all. My response is to shrug and simply say, "It's fantasy that isn't fantasy." But that's really quite unhelpful, especially as 'fantasy' itself is a vague term that encompasses an enormous range of styles and subject matter. 'Magic realism' isn't a genre, but it is possible to talk about it as a type of fiction with a distinctive flavour. There are certain basic qualities that can be called 'magic realist' that one doesn't usually find in conventional fantasy. A writer of fantasy will often try to create a place or a time that may or may not have parallels with the place and time we currently live in, but generally that invented world isn't supposed to be our world. Even if the fantasy story is set in what seems to be everyday life, sooner or later some incident will occur, an intrusion of the supernatural, that ultimately demonstrates that the fantasy world isn't reality as we truly know it. In such stories, all the magic might be said to be external. It comes from outside. In magic realism, on the other hand, the magic is mostly internal. A writer who is a magic realist rarely invents new worlds but uses this world as a stage, and yet he or she doesn't write about how life actually is but how it sometimes feels. So magic realism tends to be an emotionally based style of writing, rather than intellectually, politically or philosophically based. The prose tends to be 'hot', 'sultry' and 'tropical'. It uses exaggeration and overstatement to present the subjective worldviews of the characters and these subjective worldviews will often interact and influence each other. It is safe to say that understatement has little place in magic realism. This doesn’t mean that the blood really travelled so far, but that the emotional shock of the character’s death was so great that it felt as if his blood was seeking out witnesses to the deed. Magic realism makes very heavy use of symbolism. Every significant event is a symbol or extended metaphor, but even though those events are determined by a literal application of feeling, they are also presented in a deadpan style. So if someone is deliriously happy they might start flying, but nobody around them will comment on this miracle, even if they notice it, because the flying takes place on the inside. To redefine your own life in magic realist terms you merely have to turn every emotion you experience into a concrete symbol or action. Jumping for joy can now result in leaping over the moon or stars, but don't forget the cosmic ramifications that will follow; being sad might result in floods of tears powerful enough to destroy cities; anger may topple mountains and cause earthquakes. None of this is objectively real but subjectively it is exactly what happens to all of us during the process of living. I now expect to be told that my understanding of magic realism is wrong, for it is a style of fiction that has many advocates with opposing views as to its real meaning and significance. The best magical realists were either unaware they were writing magic realism, or else they disowned the label when it was applied to their own work, yet it's generally accepted that the original magic realist was Alejo Carpentier. Other Latin American writers evolved the form. Frustrated with the cool rationality and understatement of most Western fiction, they injected colour, vibrancy, mythology and a passion for coincidence, implausibility and hyperbole into their prose. 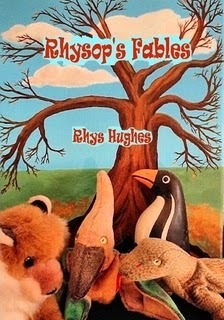 Learn all about Rhys Hughes on his website. Rhys is very prolific. 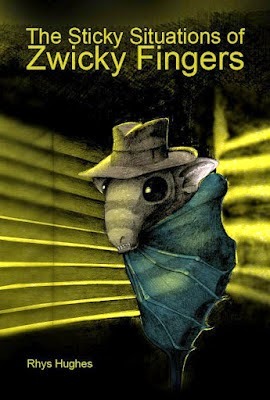 His most recent books include Bottled Love Story, Rhysop's Fables, and The Sticky Situations of Zwicky Fingers. Last week I welcomed Danielle Ackley-McPhail to discuss her re-thinking of the classic tale "Ali Baba and the Forty Thieves". Now it's time to hear the perspective of her co-author, Day Al-Mohamed. Welcome, Day! Several years ago, I wrote a story with a Chicano protagonist. I submitted it to my writing group and the first comment I received was, “Why did you make him Hispanic?” It actually came from several people with the intimation that “adding race” was unnecessary. At the time, I was taken aback. The only answer I had was: Because I wanted to. There has been a significant increase in the push for greater diversity in speculative fiction. #WeNeedDiverseBooks has some great articles, and I strongly advocate reading some of those written by N.K. Jemisin or the ever awesome Daniel Jose Older. Today, I don’t want to talk about diversity on a personal level, and trust me as an LGBT woman of color with a disability, it doesn’t get much more personal. But it is also a professional issue that should be addressed by authors. If you were to ask me (and this was a question I received from a recent convention panel): Do I think writers have an obligation to write diversely? I would say, “Yes.” Immediately, people bristle at being told they should do something, and get worried about writing something they are not, getting it wrong, tokenism, cultural appropriation etc. but let me explain. Writers have an obligation to build fully realized worlds, and yes, that means diverse worlds. Look around. In a single day, how many women do you meet? How many people of other races, nationalities, religions, sexual orientations, or disabilities do you see? How often do we see signs or menus or television programming in other languages? How many expressions of faith do we come across? What about unique ways of dressing or speaking? If this world has so much diversity, then so should those worlds we create. It isn’t just about diverse writing but about good writing. When we’re young and when we first start writing, without meaning to, we’re taught to write to the default. What’s worse, we’re taught to think to the default and that default is white, male, and heterosexual. Let me give you a recent example. In the current World Cup excitement we heard commentators, regularly referring to Landon Donovan as the "all-time U.S. leading goal scorer." He has 57 international goals. The all-time U.S. leading goal scorer is Abby Wambach, with 167 goals. The second highest scorer is Mia Hamm at 158 goals, followed by Kristine Lilly who, at 130 goals has more than doubled Donovan’s scoring. Notice something? They’re all women. When we talk and think about the sport, the “neutral” is men’s. Valerie Alexander in her recent article gives another example: “When Sonia Sotomayor was being confirmed for the Supreme Court, members of Congress repeatedly asked her (repeatedly) if, as a Latina, she would be able to remain neutral. I don't recall ever in the history of confirmation hearings, anyone asking, "As a white male, do you think you'll be able to remain neutral when deciding issues of law? "” Here, the neutral is Caucasian. And yes, as writers we fall into this default thinking too. We write the default. And just like my writing group, whether they meant it or not, we feel like we have to have some reason, or qualification for the character to be something other than the default. Why does the character have a disability? What is the significance of their race? Because it makes them who they are. Shouldn’t we want wonderful complex characters who interact with their society from a variety of feelings, thoughts, and identities? Shouldn’t we want a richer world with the complicated push-pull of politics, religion, race, culture? The default can make for a good story, diversity will make for a great one. You can learn more about Day Al-Mohamed on her website. 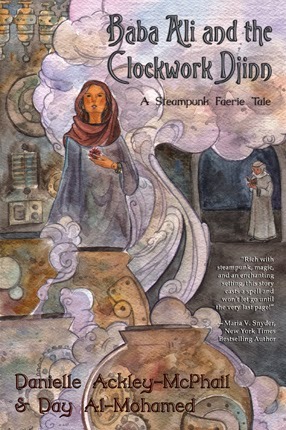 You can purchase Baba Ali and the Clockwork Djinn on Amazon, Barnes & Noble, and other retailers. We've got a two-week special going on! The two authors of Baba Ali and the Clockwork Djinn will be my guests this week and next, respectively. Today I welcome Danielle Ackley-McPhail, who talks about the crossing of cultures she experienced in researching and writing this story. It may seem odd to have a steam adventure couched in the desert, among nomads and a people long known for their faith and a belief in magic. Quite a challenge, in fact, to meld so many different threads: history, engineering, magic, and the Islamic culture. What could they possibly have in common, after all? Baba Ali and the Clockwork Djinn began—rather naïvely—as a short story based on the tale of Ali Baba and the Forty Thieves, meant for the upcoming anthology Gaslight and Grimm (Dark Quest Books). Because I always strive for authenticity and did not have much knowledge of the culture and tradition of the Middle East—beyond a familiarity with one variation of the tale itself—I enlisted the help of my friend, Day Al-Mohamed, who quickly became my co-author. Between us we used our knowledge, experience, and a good deal of research to find the right details to seed our story with to create an alternate Saudi Desert fitting to the tale we wanted to tell, where the magical and the mechanical co-existed and reason and faith mirrored one another in an intricate dance. By taking historic references—such as Charles Babbage’s work shop and Al-Jazari’s The Book of Knowledge of Ingenious Mechanical Devices and building the story around them we captured the essence of another era, grounded it in fact, and then made it our own. Thanks to resources on the internet we were able to draw on mechanical puzzle boxes, Egyptian stick fighting (dancing), early airship designs, and Persian dynastic history, all of which fed life into our tale, along with an echo of reality that makes “what if” plausible. One of my covert ways of enriching this tale could have only been accomplished via the internet. Names have power. Names have meaning. In Baba Ali and the Clockwork Djinn, those names not dictated by the original tale or history also have hidden significance—unless you are conversant with the meaning of Persian/Arabic names, then they are overt. Each name was researched and chosen for a desired meaning relevant to its use. See, as writers we build worlds and create people with our words and if we take care with our choices we do so very well. Baba Ali and the Clockwork Djinn has become a tale that the Western World can take up and experience a different era and an exotic culture so very different from their own, and the Middle Eastern World, or descendants of it, can pick up and see themselves, their culture and history, as everyone should be able to do from time to time. Thank you for reading. Come back next week to hear what my co-author, Day Al-Mohamed, has to say about the multicultural aspect of our tale.